Building a Culture of Empathy and Compassion. The Empathy Tent is an open and eclectic space for people to foster the values of empathy, compassion, connection, caring, community, freedom, peace, nonviolence, justice, empathic action, etc. Our intention is to build a culture of empathy where everyone is included, feels fully heard and accepted and we take empathic action together to transform our society. 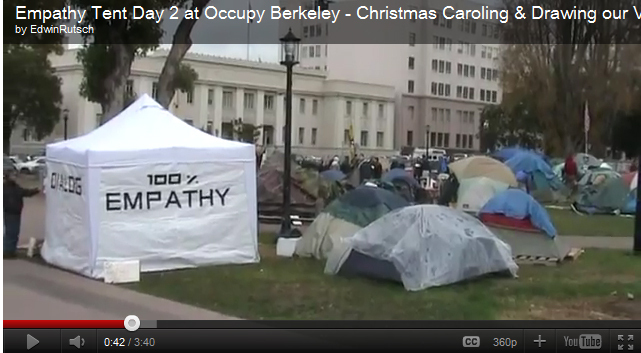 We have set up the Empathy Tent at Occupy Berkeley in Martin Luther King Civic Center Park on MLK Way and Center. 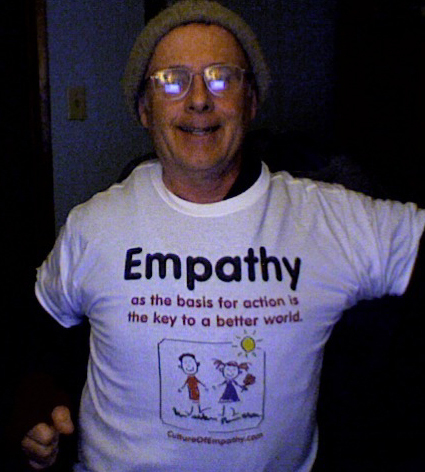 We're also organizing to set up 'Empathy Tents' at the Occupy events around the country to support building a culture of empathy and compassion. The Empathy Tent is an open and eclectic space for people that value empathy, compassion, caring, community, peace, nonviolence, justice, etc. Here are some project Resource Links. Schedule for Tent: fill out the time slots for your workshops, empathic listening, etc. offerings in the Google doc. Facebook Event for this project. Join, invite friends, post your ideas and feedback there. Shared and editable Project Google Doc - Working page for planning and designing flyers, etc. 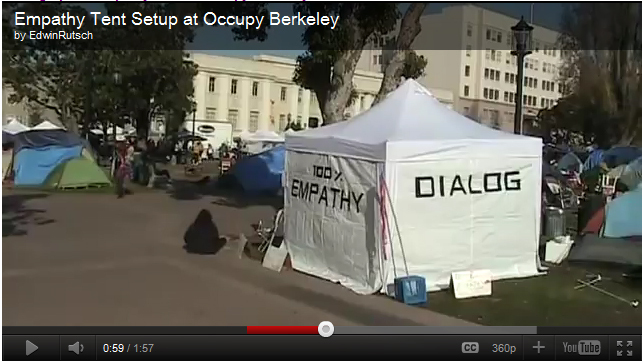 Facebook: I'm asking my friends, What should the signs say that we place on the Occupy Empathy Tent? Transforming hearts and all institutions (government, justice, education, health, corporations, commerce, media, police, military, etc.) from being cultures of fear, greed, alienation, suffering and violence, to active cultures of empathy and compassion. 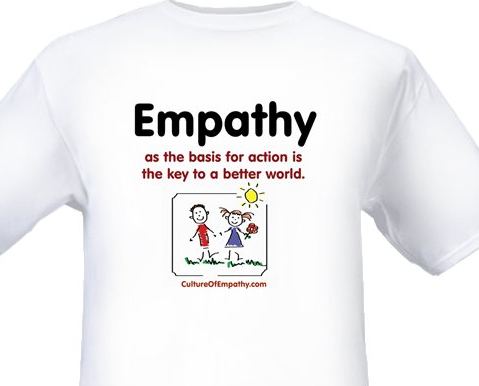 We can build a culture of empathy through connecting to our common humanity, listening, dialog, conflict resolution and empathic action! In order to empower citizens to take action, make sure everyone is heard, create connection that is heart-to-heart, face-to-face, and create an abundance of time and space for conversation and dialog to occur. Encourage listening and empathy skills. Build the common story of what's valued. Create a flyer hand out. Get along with people in stressful situations. Triggers: Help people learn and practice strategies for when they are stimulated, how to come back to a peaceful place. 2011-12-21 - Empathy Tent at the Occupy Berkeley Eviction - Thoughts on moving forward. Phoebe and I talk about our final thoughts about the results and effectiveness of the empathy tent and ideas for moving forward. This was the evening of the eviction (Dec 21) of the Occupy encampment in the Berkeley, Martin Luther King Civic Center Park. Here's a video I just reposted from a guy that was going around the Occupy Berkeley encampment the night of the eviction taping Livestream video. He did an interview with me and I told him about what we had been doing in the tent. The video is not very good quality since it was dark and was shot on a cell phone camera, however, it will give you a sense of what we were doing there. We held our Second Empathy Circle in Oakland's Frank Ogawa Plaza with the vision of building a culture of empathy in Oakland and beyond. I just got back from a Empathy Circle @ Occupy Oakland. There were 4 or 5 officials from the Oakland City mayors office and 15 to 25 community members. Meeting was facilitated by Mutima Imani. Some people didn't want it video taped but I taped some pre and post Empathy Circle video. One of the people from the administration said it was the first time they had been in dialog with people there at Occupy Oakland. Hope it's the beginning of a series of Empathy Circles. "Self-absorption in all its forms kills empathy, let alone compassion. preoccupations loom large. But when we focus on others, our world expands. and we increase our capacity for connection-or compassionate action."